MySQL to MSSQL Database Converter software is capable of converting database records created in MySQL to MS SQL database format. 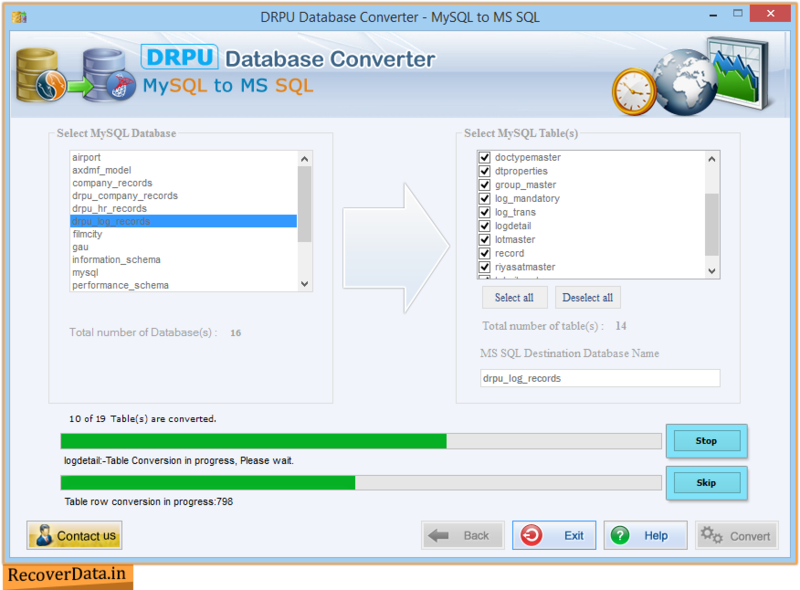 Database conversion tool allows you to make choice if you want to export MySQL database records into new database or overwrites the converted database records into existing MSSQL database. Database Converter functional utility allows you to convert 4.1 or earlier versions of MySQL using Classic Mode option. Supports to all major MySQL data types, attributes ensuring desired result by simply configuring of several options through Wizard interface. All major MySQL data types and attributes are supported. Software works with all latest version of MySQL server and MS SQL server. Software converts entire or selected MySQL created database records into MSSQL database format. Supports indexes with all necessary attributes with all MySQL and MSSQL data types and attributes. Supports all major operating systems like Window 98, 2000, Me, NT, XP, Vista in easy-to-use wizard-style interface.